If I had to sum it up with one word, I would say – kindness. If I had to sum it up with one sentence, I would say- The O’Neill is a place of excellence. If I had to sum up my own personal dialogue in my brain throughout that week, with one word, I would say- turmoil. How do all of these exists in one realm is still a mystery to me. I was surrounded by fascinating, talented, brilliant puppeteers, most of them had the highest aura of kindness there is to have, and I was fighting it every minute. Martin Robinson is whom I must take off my hat for. It was 5-6 hours every day, of constant (for me) new, challenging, theatrical and therefore threatening my comfort zone and everything else, of techniques, approaches, thoughts and questions. I knew everything he told me, everything from years of studying piano, painting and sculpture, dance and being. But then he said it, and I couldn’t believe how much I didn’t have a clue that it existed in theater, and most specifically, puppet theater. This is mind blowing, I did not start making puppets yesterday, or theater, or play. I’m awesome at that! A real pro. But when people are in the room, and when there is a method, not just a hunch, I was confronted with a very large gap, of what I thought I knew, of what I thought I’m good at, to what it’s actually about. I guess that’s called growing up, or making art. This past week at the conference was mind blowing to me in ways that will probably take me months to decipher. That is very angering to someone who takes herself seriously as a constant learner, motivated, passionate, and open. Very angering, and then, it’s exactly what growing pains are, I remind myself. It was very hard for me to look at my excellent self and say, darling, you got a longer way to go if you wanna get it. So do what you know is best – be kind, don’t judge yourself, and play. Isn’t the motto of that place is about try try again, or please fail, or something like that? It can be a double edge sword though, which may be the nature of these gatherings, where an experimental and open approach with a claim for failure is spoken with heart and intimate knowledge of what a creative process is about, and yet, when one needs to perform, we all want the very best and nothing less. Especially if we were so good from the beginning to go to this place. It seems like we all have secret agendas with ourselves, those we keep secret, and those that are kept secret from our own selves. How sophisticated are you, is perhaps where things get really deep and difficult, where we are the puppets and the agenda is puppeteering us. So I cried a lot, I was in true and loud turmoil (loud in my own brain, quiet outside). Not to add, that my birthday was that week, and I told no one. Except for one, at the end, after it happened (and another bcs of FB, it was a passive admittance). I broke my promise to stay in my comfort zone, away from people. That is probably quite stupid to think you can do that in such an intense conference. And theater is all the time about and with people people people! God, how do you guys do it? I had to miss Master classes of amazing people so I can go to my room and feel what it’s like to be alone. I couldn’t bear another minute. How does that turmoil take place in a place of such excellence and kindness, is still unclear. Back to Marty’s class. It took me 5 minutes into his class to get that he is a very mindful person. But not just regular kindness, real one. One that allowed him to be open to us, his students, with so much patience, so much openness and so much support, is insane. I teach, and I’m not half that. I also am not teaching what he is (i.e. what I hope I will be able to do one day, my personal agendas). In any case, it was a lesson every minute, beyond the skills he gave us, which were plenty, at least for me knowing nothing about all these techniques (having ‘invented’ my own), it was not that as much as it was his delivery. I was blown away. When I see people like that, or like Tara Brach, or Richard Davidson, who are about the brain, about mindfulness, that practice—when it happens in front of you it is a very loud experience of humbleness. I want to mention a specific moment that was rare for me. I sat for lunch, which ended with me and 3 dudes- Mike Oleon, Madison J.Cripps and Beau Brown. These 3 guys love Wolfy, and not until I got to the O’Neill did I know about it that much. It was so amazing, because they simply rapped on Wolfy. That is such a bizarre experience, it is my voice, my thoughts, redirected and spoken in a similar tone but with words I don’t own up to. I had planted Wolfy inside them, with my one and first time live performance at Atlanta. It was so funny my stomach hurt so bad from laughing. Here I was surrounded with only 3, but what a wonderful 3 souls who understood and loved Wolfy. When it is that real, the understanding and love, the gift is so large, and so very much humbling. Another moment was when Fred Thompson from the shop said, “Oh that’s not a problem I will do it for you.” I didn’t know who he was, in retrospect, I understand he is there to help us, but he was so cool about it, and so supportive, that somehow I left my puppet with him and he made the mechanism for the wings to fly on my bird. After that, he also listened to me complain, saw me cry, comfort me, make me laugh and make me feel at home. How amazing is that? Then Marty again. There are many moments, but one of them was when he came to the Farmhouse where I had my room, and he sat for half and hour and drew for me a mechanism for Wolfy. Before that Matthew, the crazy talented guy also drew a mechanism for me. But here was Marty giving me a private lesson with his 30 years of experience, just for Wolfy and me. What a mechanism, I will have to now go and break my head till I crack that one out, what a lesson. How kind can one be? And many more wonderful moments include more wonderful people, those who puppeteered for me, those who taught me voice, and directing, and movement, and listening once more. I can go on and on but I will stop here. I just want to say that learning this past week at the O’Neill was worth my turmoil. And I also want to say that it’s ok to not know. And, I still want to be a wolf, and I still want to eat the world! 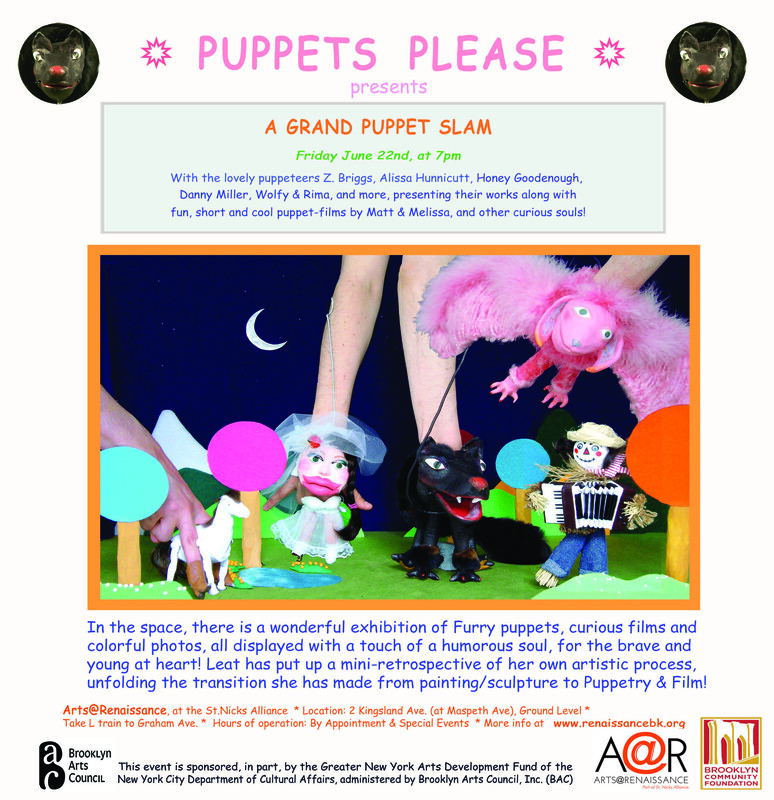 Grand Puppet Slam this coming Friday at 7pm. Come at 6 for the exhibition, stay for the show!! Puppets Please – Solo Exhibition! Furry puppets, Curious films, Colorful photos and Secret sketches, displayed with a touch of a humorous soul, for the brave and young at heart! 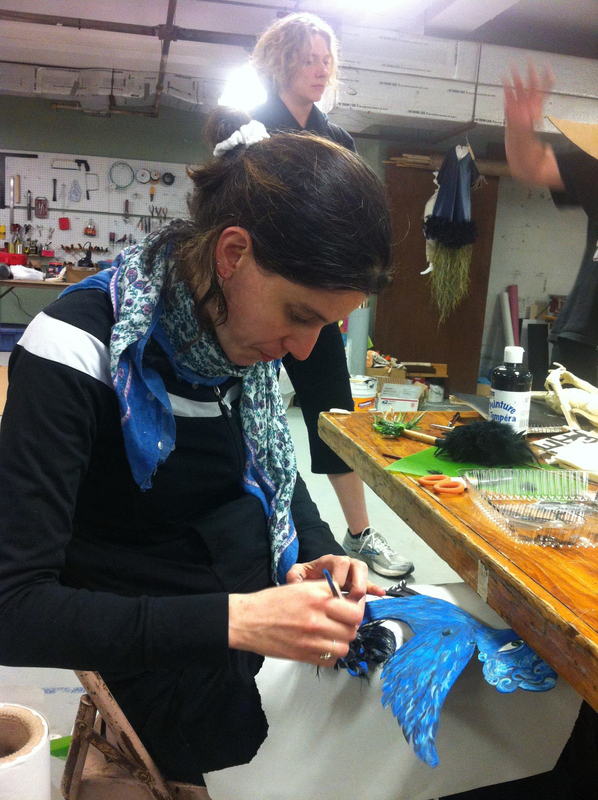 from having been a visual artist [painter, sculptor] to becoming a joyful filmmaker-puppeteer!!! Please come at 6pm to see the exhibition, and stay for the film! Here is a link to a sneak preview of the show! All events will take place at: Arts@Renaissance, 2 Kingsland Avenue (corner of Maspeth Avenue). Enter via Garden Level; in Brooklyn, NY. By train- take L to Graham stop. New York City Department of Cultural Affairs, administered by Brooklyn Arts Council, Inc. (BAC). Solo Exhibition Opening, May 3rd, 7pm! Wolfy & Rima at Voice4Vision Puppet Slam! 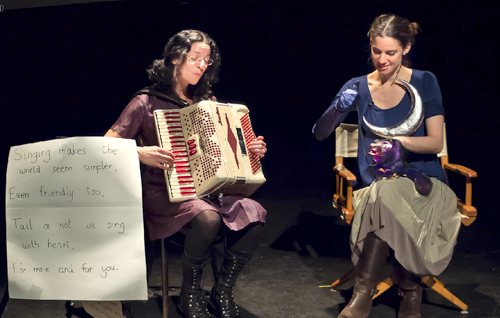 Wolfy & Rima have performed last Sunday, December 18th, at the Voice4Vision Puppet Festival’s Puppet Slam. It was my 3rd live performance– I can still count it on one hand! I was more relaxed knowing that the lovely and talented Rima will be on my (Wolfy’s) side, but it was still a leap of faith for me. Performing in an enclosed space, with a mic, means that people actually get to hear me being Wolfy, and be intimate with what Wolfy is offering. Placing myself in such a position, in addition to being the opening act of the evening, put me in a very vulnerable state. I welcome such state with fear and wonder. For me, the place where art stems from and aims to, is exactly that place where all weapons are down, and even though I transmit myself via a furry object, I hope to succeed in touching people’s hearts, desires and fears. This wonderful evening was was curated by Jane Catherine Shaw, Honey Goodenough and Karen Oughtred. My deepest thanks to these lovely people for helping make this lovely evening come to life. This great still of Rima and myself was taken by Lee Wexler/ Images for Innovation. The performance was shot by my dear collaborator, Shachar Langlev. 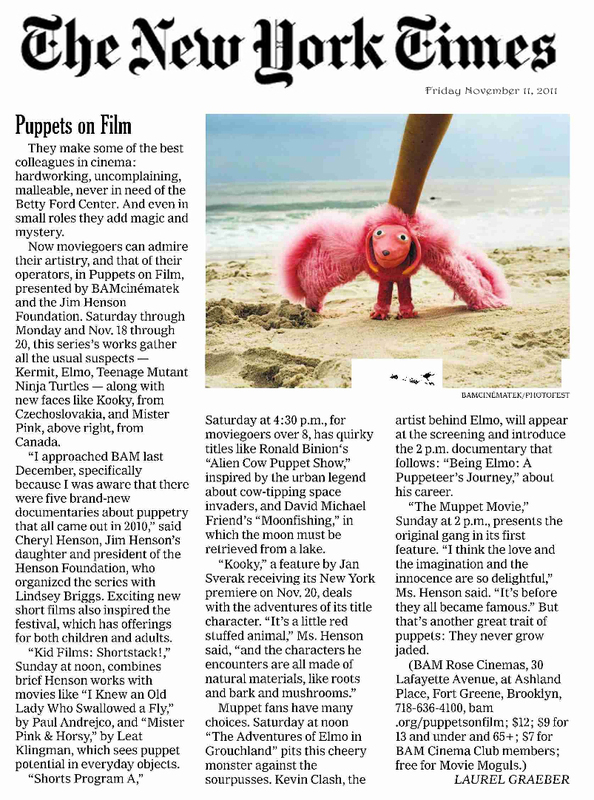 Puppets on Film at BAM, and Mister Pink is screening this Sunday! Mister Pink & Horsy, showing at BAM, this coming Sunday at noon. Join us!!! 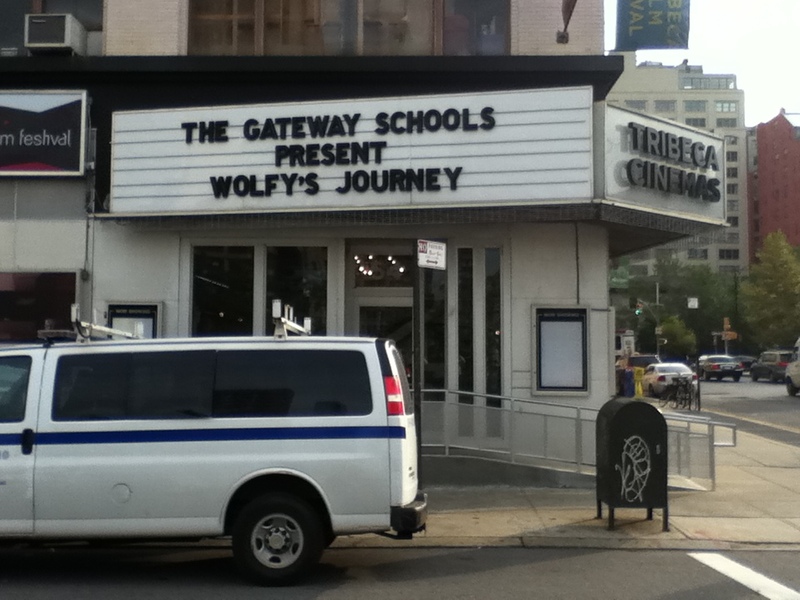 Special screening of Wolfy for Gateway! What a lovely night! Many thanks for all the people who have made this night possible for me. I am humbled and eternally grateful. It was so wonderful to be able to share my film with my dear students and colleagues, in a real film theater!